This isn't even a fan comic. Nah, butit is one of my favorite pics. Nice pic Ayana! And RUN FOR YOUR LIVES! THERE'S ANOTHER BOY TOY ON THE LOOSE! *is considered synchro's boy toy by her mother* That's Geisha Darn it! Yeah, them Geishas are weird. I'm glad I'm just a boy toy. 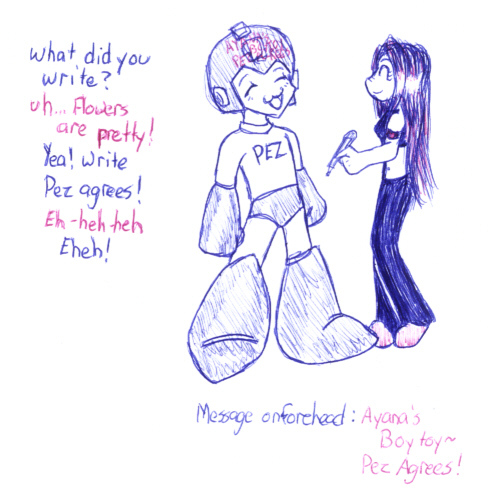 Well, if you're going to get burned so much for it, why not just fuel the fire and post some of your other "Pez is Ayana's boy toy" pictures? Lies! Lies! Lies! Okay. It's true. But I'm not crazy! You're not crazy like I'm not crazy! And that makes a flower of another color. You mean the pretty ones?